AEC is the new brand range of air source heatpumps from SOLFEX energy systems. Watch our new video to find out more about them. For further information and full technical data, click here. AEC is the new brand range of air source heatpumps from SOLFEX energy systems. Watch our new video to find out more about them. For further information and full technical data, click here. This smart Regatta Professional jacket is water repellent and wind resistant to keep you staying warm and dry on the job, and features SOLFEX branding on the chest and sleeves. At SOLFEX energy systems, we are committed to providing detailed technical support in any way we can. That's why we've created a short video installation guide to demonstrate how you would go about installing our patent-pending, low profile, WARM-BOARD system. If your considering using WARM-BOARD for an upcoming project or are simply curious about how simple it really is to install a WARM-BOARD system, we highly recommend watching it. We're please to announce that No More Ply cement boards and solid bed adhesives are now in stock at SOLFEX energy systems. No more ply cement boards are a simple addition to any underfloor heating installation that help evenly distribute heat across the floor surface and increase the efficiency of the system. 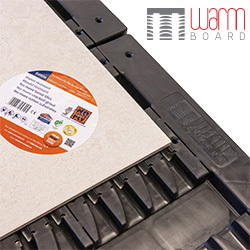 With a thickness of just 6mm, No More Ply cement boards perfectly compliment the WARM-BOARD underfloor heating system. Successful Battery Storage Events, units now in stock! Earlier in the month, we held 3 training and information events around the country in anticipation of the new Samsung SDI All-in-one battery storage system. We'd like to thank everyone who came to the events, we've had very positive feedback and we hope that we answered all of your questions on battery storage. For those who couldn't make it, there is now a complete collection of technical documentation, an install video and the presentation used at the events available for download here.